Bespoke three tier Minnie Mouse cake to your chosen design, customised with name and age. View our recent celebration cakes. x2 Stands of decorated Minnie Mouse cupcakes personalised with age/name. Check out our cupcake gallery. Minni Mouse cake table decorated with tablecloth, runner & hand made tissue paper tassel garland. X2 Large balloon bouquets with foil character & latex balloons, perfect party entrace/door way. 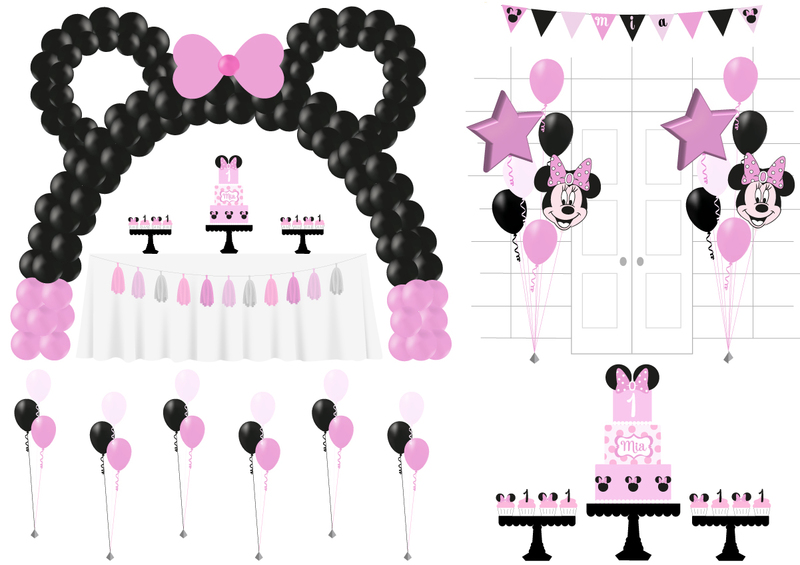 X1 Large Minnie Mouse balloons arch with mouse ears. X1 Personalised Minnie Mouse Birthday bunting with your age/name. X6 Table top balloon bouquets in Minnie Mouse colours. Our Minni Mouse balloons can be personalised with names, message, age check out our balloon chart. We can create customised individual Minni Mouse take away boxes/gift bags to hold personalised cupcakes, treats and sweets from £3 per each. Contact us for more information. To hire our pink table runners and Minnie Mouse chair covers please contact us for a quote. For additional Minnie Mouse balloons & bouquets see our balloon chart. Turn your Minnie Mouse cake table into a show stopping candy buffet with jars and platters of sweets and treats in a beautifully detailed display. View our candy buffet gallery for inspiration. To personalise your Minni Mouse party spell out any message, name or age with our XL 3ft foil letter/number balloons for just £8.50 per balloon. See our balloon char. Add some sparkle to your ceiling with light up flashing led balloons and wow your guests with a magical twinkling effect. See our balloon chart for more information. To hire our pink table runners and minnie mouse chair covers please contact us for more information. display. View our candy buffet gallery for inspiration.